In beautiful May days, Qitai observational base is carpeted with green grass and blooming flowers. Here at the Qitai base conference room, the site office meeting for the 110-m aperture fully steerable radio telescope (QTT) was held from May 12th to 13th. This meeting demonstrated that we are qualified for carrying out the site works. 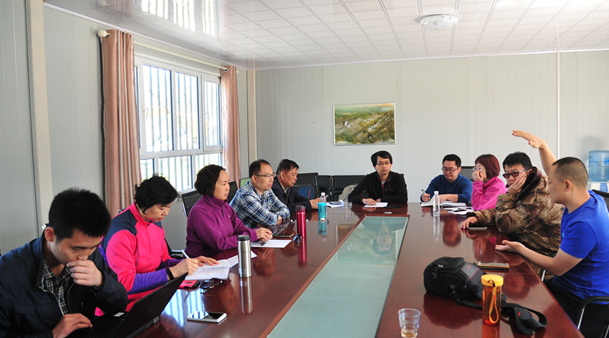 Dr. Na Wang, Director of Xinjiang Astronomical Observatory (XAO), who presided over the meeting, said that we are at the stage of base development, and that we should enhance the site preparation work to ensure the QTT project construction can be smoothly accomplished. This is a great challenge for the staff at XAO, and we should have the spirit of contribution and courage to face challenges. Let’s “roll up our sleeves and pitch in together”. During the meeting, leaders from each groups delivered their reports to show their progresses and action plans. Attendees of the meeting responded with thankfulness for the challenges given to the young scientists, technicians, and all staff at XAO. We will join our strength and make unremitting efforts to the construction of the QTT project.